GRAFENWOEHR, Germany — A potentially dangerous caterpillar species was recently discovered by garrison cleanup crews in heavily forested areas of the Grafenwoehr Training Area, according to reports from the public works division. Following the devastating August storm that blew through Vilseck and much of the surrounding training grounds, workers with the U.S. Army Garrison Bavaria Directorate of Public Works and Environmental Division responded in a rapid collaborative cleanup initiative, thrusting teams of experts into damage sites. Shortly after clearing debris from a storm-ravaged portion of the training area, two DPW workers developed skin rashes along their arms, said Jeffery Heath, Operations and Maintenance Division manager, DPW, USAG Bavaria. The workers had just finished removing pieces of broken and decaying old oak trees from remote wooded areas. 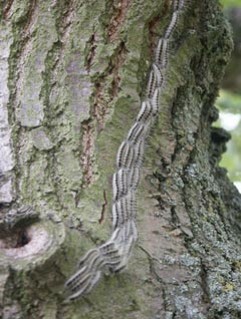 Health officials from both the Vilseck Army Health Clinic and the clinic at Sulzbach confirmed that the skin irritation was caused by direct exposure to residual hairs of a common caterpillar species present across most of southern and central Europe: the Oak Processionary Moth, or Eichen Prozessions Spinner in German. 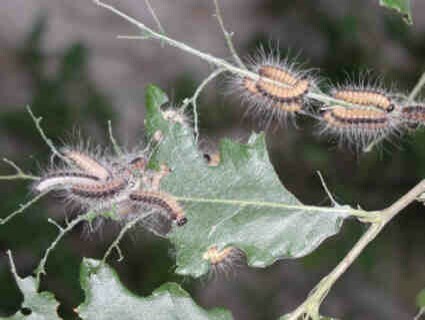 These hairy oak-residing caterpillars are a native of the Mediterranean region. But in recent years, they’ve steadily begun migrating north to take advantage of Europe’s temperate climate and have become increasingly common in areas with a substantial oak tree presence. 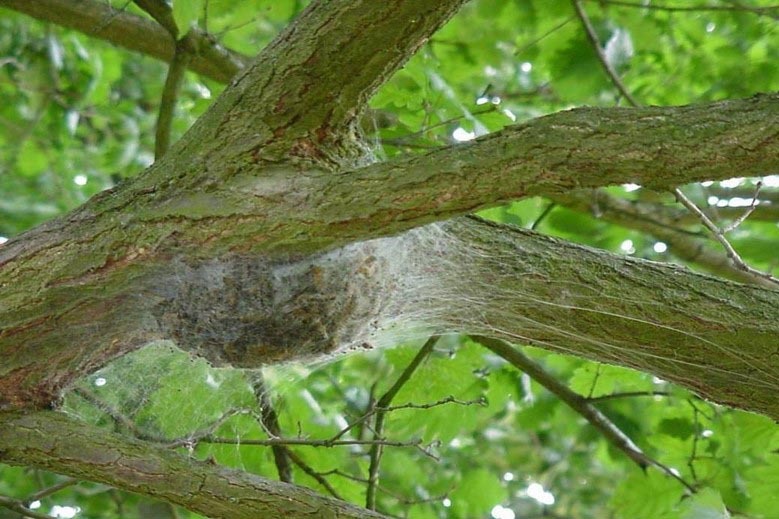 Oak Processionary Moths are most dangerous during the species life stage as caterpillars, which typically occurs between mid-April through July, according to U.S. Army environmental and health experts. During this stage, the caterpillars are covered in long, fibrous hairs composed of thaumetopoein, a toxin that can cause adverse reactions in humans and animals if touched or inhaled. The spiny caterpillars are not a particular concern, however, in their latent larvae or final moth stages from the end of the life cycle in August through the beginning of April, according to U.S. Army Public Health Command Region-Europe. DPW and Environmental crews regularly undergo extensive survey efforts to locate and manage the population of these caterpillars throughout all four the installations, said Heath. “Our guys are out there cutting grass, trimming trees. Playgrounds, parks — those are the first place they look,” Heath said. “Each tree in the cantonment area has a nail in it with a number. We know where all the oak trees are. We can pull up an overhead with geographical information, and it will note every oak tree,” Heath said. Still, caterpillar nests sightings can still surface, particularly in outlying regions of the Grafenwoehr’s expansive training area. Community members should remain vigilant and understand health concerns associated with exposure, Heath added. In some instances, the caterpillar hairs can cause severe allergic reactions. Exposure to eyes or mouth may cause conjunctivitis, an inflammation of the eye, or irritation of the throat. In addition, accidently inhaling the toxin and exposing it to the lungs may induce severe reactions and asthma attacks for asthmatics. These sorts of reactions may warrant immediate medical attention. Oak Processionary Moth caterpillars reside in the upper branches of oak trees commonly found in relatively isolated areas at the edge of a forest or parks and playgrounds. They are often found wrapping in bundles around tree trunks and trailing in long lines or processions — hence the name — to and from their nests. Removing Oak Processionary Moth caterpillars and their white-gray weaved nests require the use of special equipment and safety gear. Do not touch or attempt to remove the caterpillars, their nests or eggs. During peak maturity from April and July, community members should refrain from picnicking, playing and walking near oak trees, and wear appropriate outdoor clothing in wooded areas. Keep children and pets away from caterpillars and nests.